The adult version of Circletempo’s MYTH is now available for pre-order on MangaGamer.com! The all ages version will also be available on Steam upon release on October 28th! And so I gazed at the sky. A sky with no tomorrow. A world where everything had already reached its end. I was determined to stand up against that. The story begins in the distant future. The protagonist Meito Tanabe lives in the “world of light” – a world where no shadows exist. Yet, the “world of shadows” reaches out to him through Shimon, a girl possessing a shadow, who brings him into that world in which she lives. Players will soon find there’s more than meets the eye in MYTH, which features multiple interlocking story arcs that borrow heavily from Norse mythology. Included in the game is a note system and a highly-detailed character relationship chart for players to reference as they get absorbed into the universe. 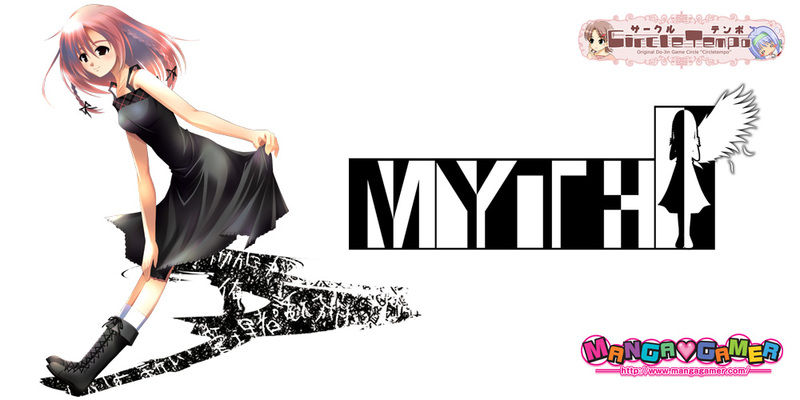 MYTH also has a stellar soundtrack, featuring Kino Nei, Luck Ganriki, and Katakiri Rekka, all of whom worked on music for 07th Expansion in various capacities. Fans of horror or doujin games, like the Higurashi series, won’t want to miss this title! « Higurashi Chapter 4 Himatsubushi is Now On Sale!